Although Eritrea is not well known as a bird watching destination, it has an impressive bird life of over 560 species, some of them prized as the Abyssinian 'endemics'. 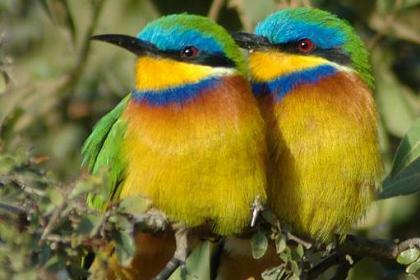 Eritrea is heaven for bird-watchers. Eritrean is a safe destination for those who want to spend a week of adventurous bird spotting. The opportunities for bird-watching include the Semenawi Bahri (Filfil Solomuna) rainforests, Dahlak Islands, The Buri Peninsula, Gash Barka, Elabered / Keren, Adi Keih and Asmara. As a result of lack of infrastructure, travel restrictions and the tense situation on the border, visitors should contact an experienced travel agent for advice. Dawid Berhane, professional tour guide in Asmara area is a passionate bird-watcher. Blue Breasted Bee Eaters (Merops Variegatus) - Semenawi Bahri Eritrea.